...your Composition Book & blue folder. Prompt: What are some reasons you liked or disliked the collaborative essay writing process so far? I can strengthen my writing through revision, editing, rewriting and determining how well I fulfilled the purpose or the essay and the audience for which it is intended. I can work collaboratively with my peers to write a coherent (logical) essay. I can be a productive member of a group that has a single goal to achieve. Be sure you have your own copy of the essay for editing purposes! Using NEW and Improved TREES Tag, switch essays with another group (Mr. DeGrandis will facilitate this process). Using TREES Tag and proofreading marks, edit essays from other groups. Staple the TREES Tag on top of the edited essay and hand it in! Then... get QuickWrite #2 out of your blue folder. 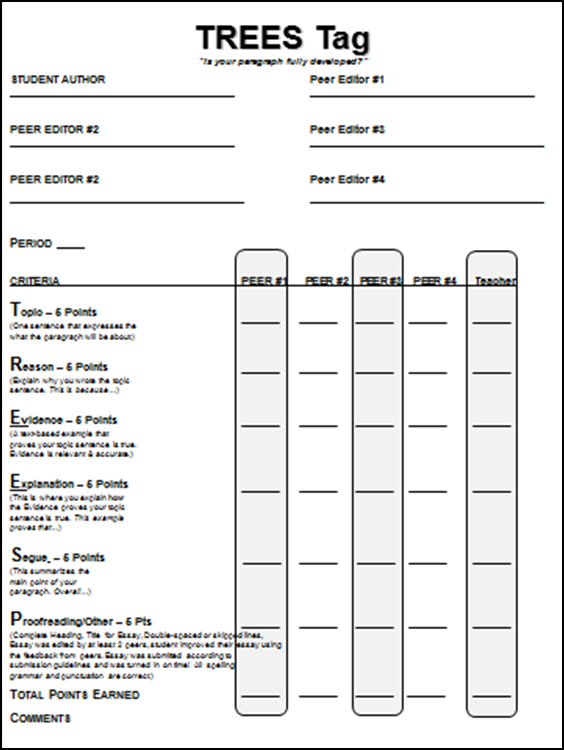 Get a new TREES Tag and have each member of your group proofread and edit your essay. Staple the TREES Tag on top and replace it in your blue folder for word processing next week. One piece of red, green or white paper and a marker. A short story made up of very few words. I can write stories about real or imagined experiences or events. I can use precise words and phrases to convey real or imagined experiences. Mini-Lesson: What is a Six-Word Memoir? Six-word Memoirs with a Christmas Twist! Holey stocking. Cried until New Years. Heard reindeer pause. Found white whisker. Thirteen Christmases with you. First without. Hoof slipped. Broke antler. Send elves! Surprised under mistletoe. Wrote hit song. Write your own Six-word Christmas Story. 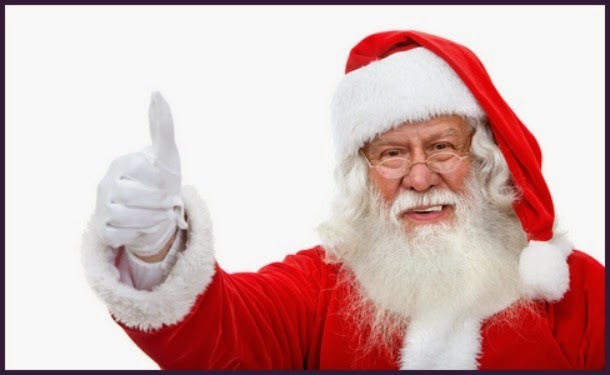 Hand in your your Six-word Christmas Story by the end of the period copied onto red, green or white paper. The best ones will be hung in the hallway outside of room 178 for all to enjoy! This is a classwork grade worth 30 points! ...any handouts in the back of the room in including a half sheet of loose leaf paper. 1. communism, n. (communist) - a system of government based on the idea that the community or state should hold property, so everyone shares equally. Ho Chi Minh believed in communism and thought everyone should share wealth equally. 2. conviction, n. - (convict) a strongly held belief; a formal judgement that someone is guilty of a crime. It is my conviction about conservation that makes me recycle plastic water bottles each week. I can site evidence from the text to analyze how various sections of the novel reveal aspects of Ha's character. I can cite evidence from the text to analyze how the central idea develops over the course of the plot of Inside Out and Back Again. Today we will be reading about historical events from Ha's point of view and complete a graphic organizer that will capture your thoughts about it. Turn and Talk: What is plot? Get into Numbered Heads Together Groups! Take out the Double Arrow Graphic Organizer. Re-read the two poems "TV News" (pages 24-25) and "Closed Too Soon" (pages 38-40) to yourself. Notice the details! You may fill in the bottom portion of the organizer. Pair-Share-Write: Select a member of your group and share your thoughts about the poems. Then get with your group and share your pair's thoughts with your whole group. Take out the Lesson 8 Text-dependent Questions handout. Rereading: "Two More Papayas" and "Promises" - What Matters to Ha? Let's look at what is going on around Ha, specifically her papaya tree. Reread the two poems above to yourself. Take notes on the Double Arrow Graphic Organizer as you read. Pair-Share: Share your notes with a partner within your numbered heads together group. What are some things you notice about the events in the novel and the papaya tree? Share your thoughts with your group. 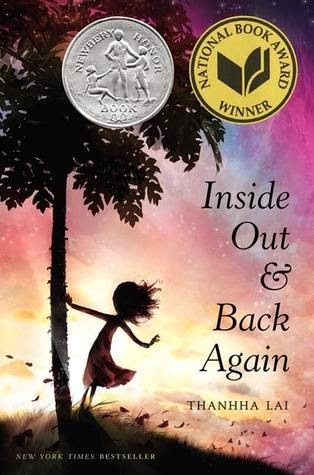 Read pages 42-47 of Inside Out and Back Again. You copy of your collaborative essay. Many English teachers cringe when they hear their students use the non-word "mines". 4. alienate, v. (alienated, alienates, alienating) - to cause (someone) to feel that she or he no longer belongs in a particular group, society, etc. He alienated most of his friends with his bad temper. I can support a claim with clear evidence and explanations. I can write a paragraph that has a logical flow of ideas. I can write quickly and legibly with a limited amount of time. Decide whether you think collaborative essay writing is more of a negative or more of a positive and explain why. Do not pick both! Be prepared to share what you wrote with a partner and the class. This is a timed response. You will only have 15 minutes to complete this essay. Switch composition books with a partner. Read their response to this prompt. Tell your partner why you agree or disagree with them. Be prepared to share your essay with the class for a participation grade worth 20 points! I think the collaborative essay writing assignment was a positive experience for several reasons. 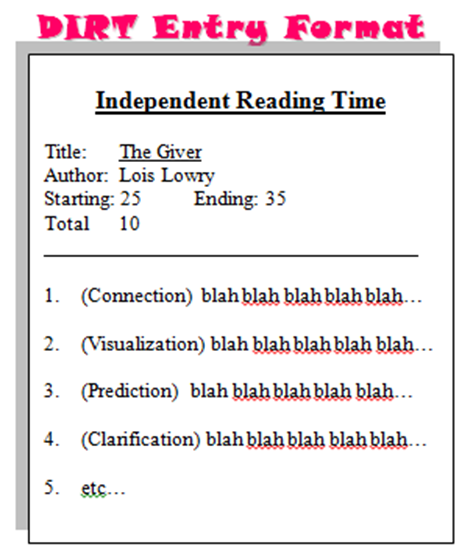 This is because it helped improve my ability to analyze how informational texts relate to fictional texts. For example, working with a small group helped me come up with more ideas than if I had worked alone. My group came up with a connection between the texts I hadn't noticed. I didn't notice the connection between Ha's brother's story about the pilot that bombed the presidential palace and Ho Chi Minh's invasion of Vietnam. Another reason the collaborative essay writing activity was a positive is that it helped me improve my own writing skills. At one point, I offered an example of a connection between the texts that wasn't very good. One of the members of my group asked me to explain how my example connected to the topic sentence. I couldn't explain it because it really didn't support the topic sentence of our essay. I learned that I must be more careful selecting examples that i can fully explain. Overall, the collaborative essay writing assignment was a great way to help me improve my writing skills and analyze how informational texts can connect with fictional texts. Composition book check of reflection essay.